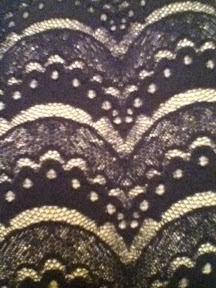 Today I found some amazing lace print tights at H&M. Lace tights are pretty common, but these ones have the print running horizontally, and the lace looks scalloped. THE BEST PART: they're only 6.95! I bought them in navy blue and black, but they also come in a pinky cream colour that would be really well suited for Cult Party. I can hardly wait to wear these in a coord! I got the same tights ;) I love them so much.